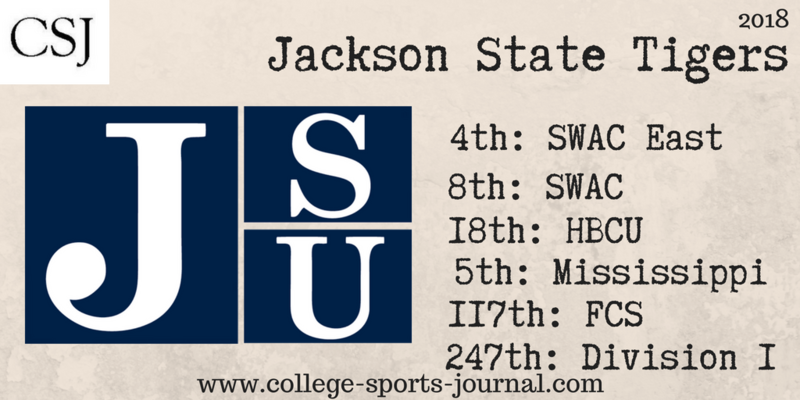 2017 In A Sentence: The Tigers started the first seven games all with losses but signs of improvement happened as JSU won three of its last four contests to finish 3-8 overall and 3-4 in league play. Biggest Shoes to Fill: LB Shawn Bishop was an All-SWAC 2nd team performer last year and a leader on the defensive side for the Tigers. He finished his senior campaign with 74 tackles (28 solo), 9.5 sacks, and 2.5 fumble recoveries. He was ranked 7th in the league in total tackles and 14th in tackles for loss. Key Player: RB Jordan Johnson finished with 647 yards and 6 touchdowns on the ground in 2017. The junior will likely have a bigger role this fall and the offensive success will be key as JSU will have a new signal caller as well as a change of offensive philosophy under new offensive coordinator Hal Mumme (the former Kentucky, New Mexico State and Southeast Louisiana head coach). Fearless Prediction: The new Mumme spread attack offense will likely take time to get going so surpassing the three-win total may be too much to ask in 2018 especially breaking in a new quarterback but likely will pay dividends in future seasons.